I am a Taurus, which means a lot of things, but one of our primary tendencies is a draw to all things decadent. I crave delicious foods, love rich fabrics and colors, and have a passion for beautiful details. Today I couldn’t shake the craving for chocolate. 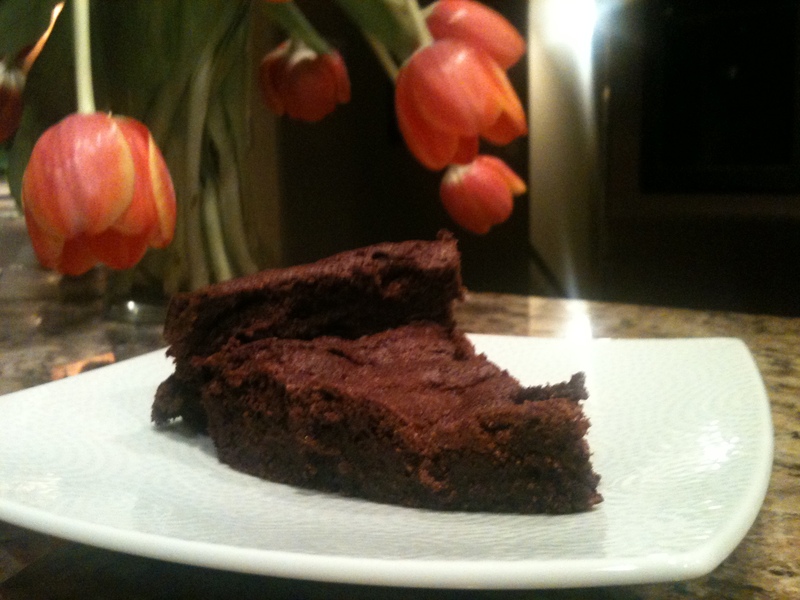 So, I pulled my 9 year old son into the kitchen with me and we made this amazing flourless chocolate cake. My kids love to work in the kitchen with me and we have a lot of fun baking. This cake is great for any occasion because it can be dressed up for a dinner party or enjoyed by the family. It’s your versatile Little Black Dress of desserts. Follow the instructions to the T… and know that it will rise beautifully in the oven and then fall so fast your heart will stop… but it’s meant to! One bite and your heart will go pitter patter once again! Bon Appetit! Lay a sheet of parchment paper on the inner piece of the pan, then tighten the outer ring around it. Melt your butter and chocolate, in 30 second intervals in the microwave. Once melted, whisk in the sugar. Add your egg yolks, one at a time. In a separate bowl, whip with egg whites on high til peaks are stiff. Fold egg whites gently into the chocolate blend and pour into the Springform pan. Bake at 325* for one hour. Remove, cool and sprinkle with powdered sugar.